Whilst recovering from my keyhole surgery, I decided to make something for myself for a change! 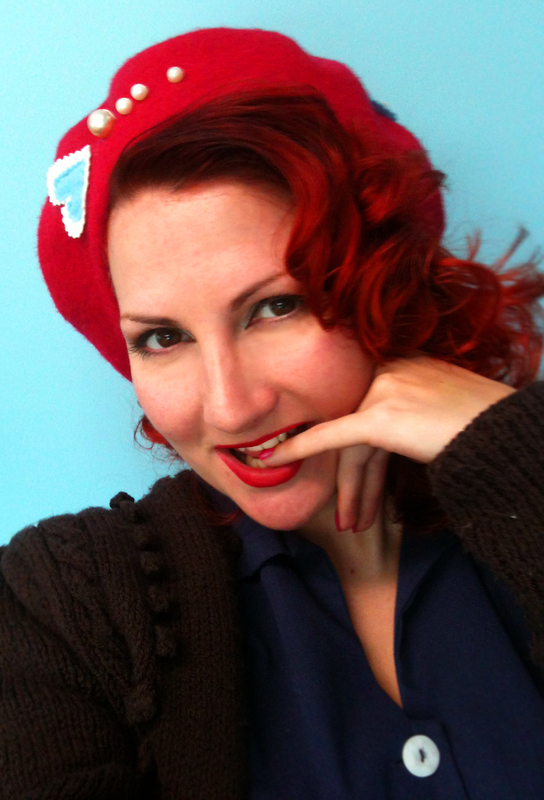 I am a huge fan of berets, so took one out of my cupboard and set to work on decorating it. I have to say it was highly enjoyable and I was very pleased with the outcome! 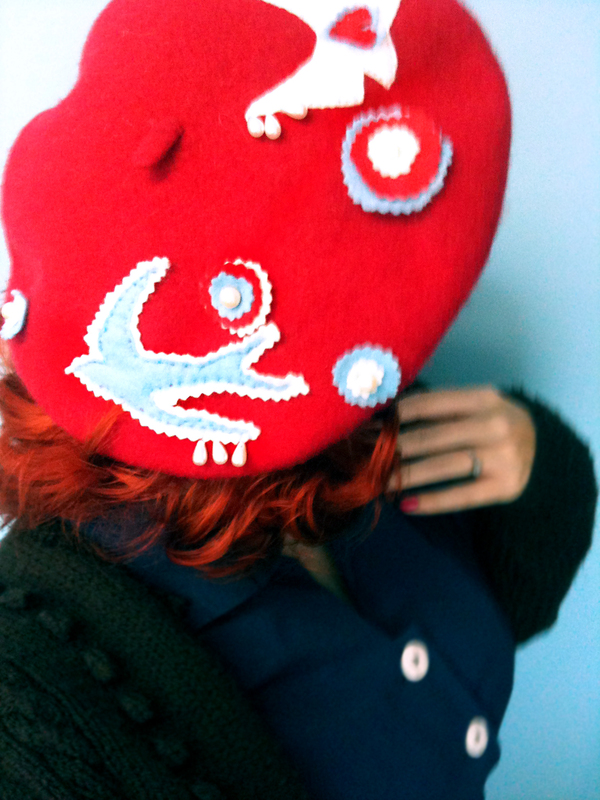 With pearl beads from a broken necklace and felt swallows, hearts and flowers, it has cheered up my headwear no end and looks great with my red coat! I will make some to sell if the prove popular! Posted in Arts and Crafts and tagged blogs, crafts, felt crafts, kitten von mew, pinup girls, vintage girls. Bookmark the permalink. I always longed to share similarities with a star like Marilyn Monroe. I never thought it would be Endometriosis…some of you know that I suffer from this rather unglamorous disease that causes rather a lot of pain, discomfort and fatigue. Unfortunately things have gotten so bad that no amount of rhinestones or shoe shopping can take my mind off of it, so it is time for more surgery. The last time I had this surgery was around 8 or 9 years ago and the recovery time was long and uncomfortable. They inflate around your organs and unfortunately some air stays trapped when they close you up, with no where to go. So for a while I was shiny skinned, inflated and could not wear bras for a while as I couldn’t do them up! I moan now, but golly! What relief when I had healed! My pains had all but gone and other than having to take hormone tablets every day as medication, I felt fine for alteast 6 years after the proceedure. So many women suffer with Endometriosis and don’t even realise they have it. Heck, I was going back and forth to the doctors for 4 years complaining and was fobbed off time and time again with IBS etc. It was only when I went to a specialist that I found out the likely cause of my pain. If you suffer from incredibly painful, heavy and uncomfortable periods – To the extent that you have to take sick days or know that it isn’t normal, if you have constant dull aches in your tummy and possibly legs and lower back, if you suffer from fatigue…Go get checked out. 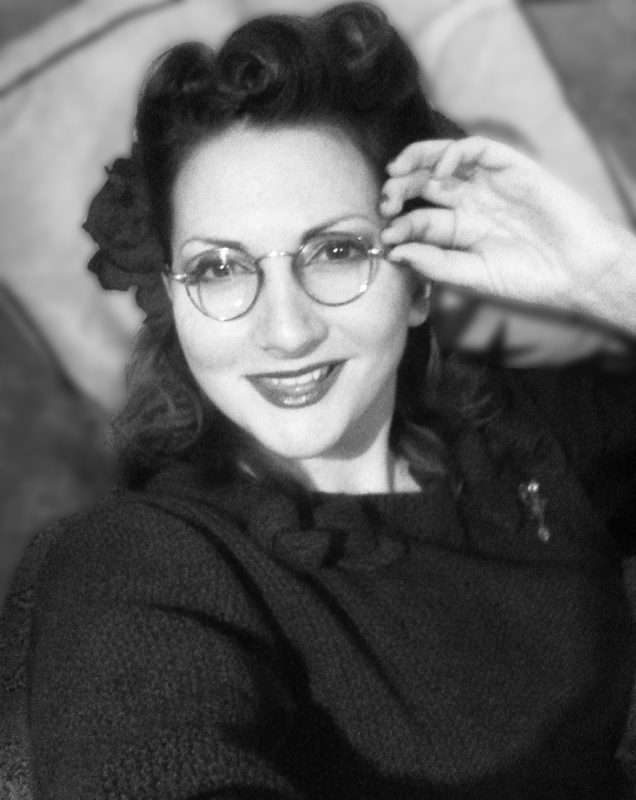 Posted in Day to Day and tagged diseases, endometriosis, health, kitten von mew, pinup girls, vintage girls. Bookmark the permalink. I have updated my Sew on and Sew Forth page with fabulous new images AND a new style! My Pincushion Corsages are the handiest pincushions for tailors and dress makers. Ideal for alterations at events, hemming dresses at home or in your shop, they are pretty and functional at the same time! The felt petals double up as needle book pages, whilst the centre of the flower is a pincushion with stamen dress pins included! The flower is attached to an elastic wrist strap and these corsages come in a wide variety of colourways including my special Coronation Corsage in red, white and blue! At £15 each, these are 100% handmade, hand finished and great Christmas gifts. I will be selling them at vintage fair on 18th December and mail order by emailing kvm@email.com. Pincushion Corsages by Kitten von Mew! Posted in Arts and Crafts and tagged corsages, crafts, felt crafts, pincushion cups, pincushions, pincushon corsage, vintage pinup. Bookmark the permalink. Day of Remembrance or Profit? I have just payed my respects in the 2 minute silence to those who have fought or fallen in the World Wars and more recent battles. Wearing the poppy I bought from a charity volunteer of the Poppy Appeal, as I have done since I was 6 years old, I wear the symbol on my lapel to show that I care and that I have donated money to a good cause. 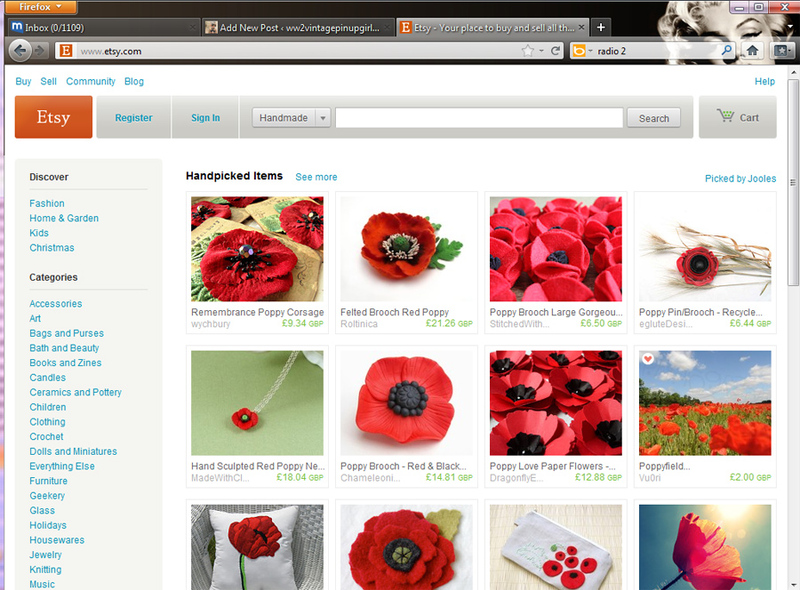 Sellers cashing in on Remembrance Day poppies without giving anything to charity. 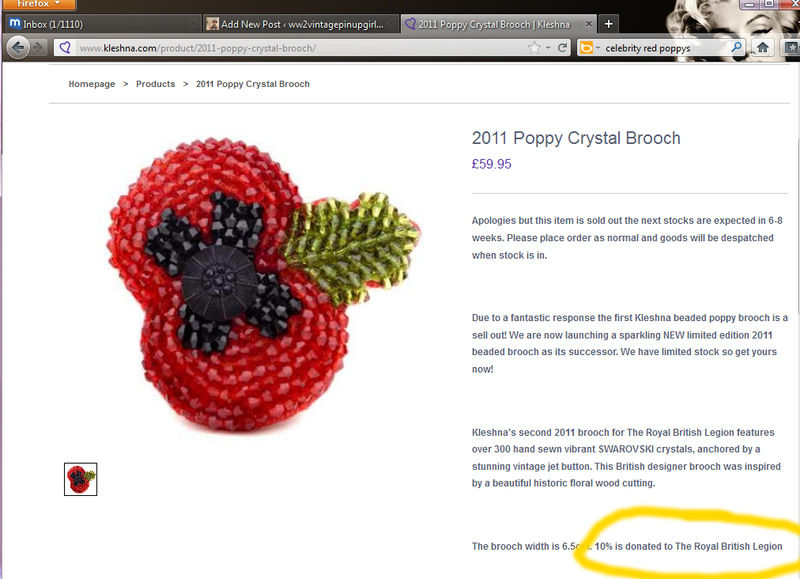 And don’t get me started on the celebrity favourite Kleshna who have created brooches costing £50-60 ‘For the Poppy Appeal’, yet only give 10% to the charity?!?! If this isn’t cashing in I don’t know what is! So you are enticed to buy one of these brooches (and fair enough, some I have seen are beautiful) and encouraged to wear it again each year. So they’ll still buy a charity poppy next year? Sure they won’t. They spent £50 on a brooch last year. Ok, so Poppy Appeal may have gotten £5 out of the sale, but they will lose sales of poppies in coming years after this type of extravagence. It doesn’t take much to dip into your purse each year and buy a £1 poppy from someone who is volunteering their time to stand out in the cold to raise money for this amazing cause. Why then give that money to greedy jewellers instead? So please people, even if you decide to stick rhinestones on your poppies each year or do as I did as a kid…buy lots of poppies and put all the red petals together on 1 stem, put vanity aside for just 2 days (11th November and Remembrance Sunday) and remember what these little paper poppies stand for and what they raise for charity. 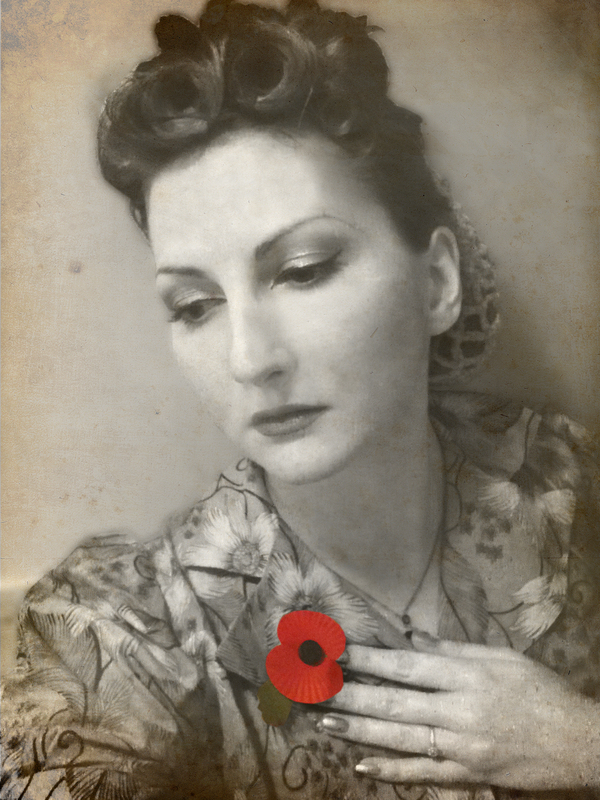 Posted in Day to Day and tagged armistace day, blog, kitten von mew, poppies, poppy appeal, poppy brooch, remembrance sunday. Bookmark the permalink. I will be selling a selection of vintage clothings, repro clothing and pincushion tea cups at The Vic in Swindon on 18th December 2011! They are hosting a Vintage Fair & Tea Party from 12 – 4pm with free admission! Posted in Arts and Crafts, Events and Performances and tagged crafts, events, kitten von mew, vintage clothings, vintage fairs. Bookmark the permalink. Yes indeedy ladies and Jedi’s, you heard correctly. What did I sit there and sew all day yesterday? Possibly the most out of this world teacup pincushion in the galaxy. This glass cup and saucer holds by interpretation of the famous statue of ‘Atlas’ (man with the world on his back). My pin cushion features an original vintage R2D2 toy (worth £20 I may add! ), holding up a Death Star pin cushion. Not only that, I have created a Tie Fighter on a pin too! 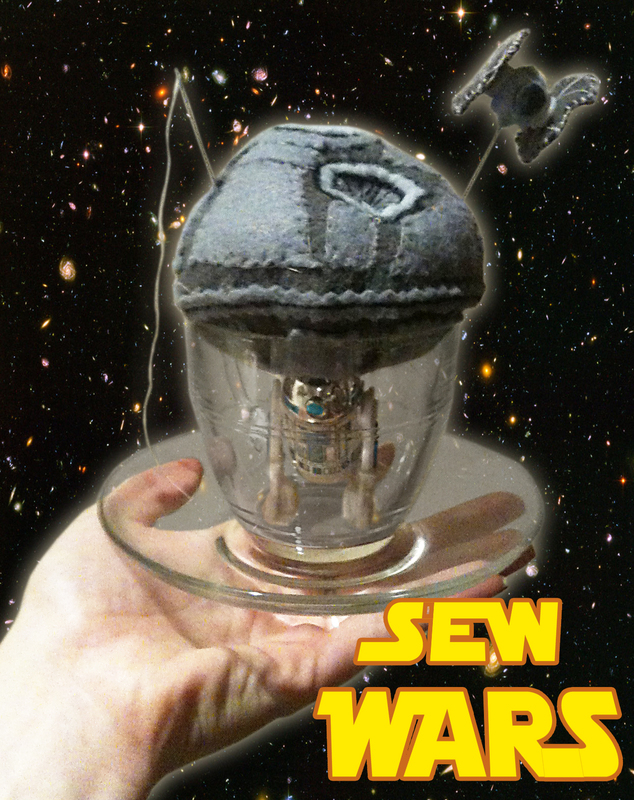 Kitten von Mew's Handmade Death Star Pin Cushion Cup! Please leave comments below as I would love to know what you think! Posted in Arts and Crafts and tagged crafts, death star, gifts, kitten von mew, pin cushion cups, star wars. Bookmark the permalink.